now we’re playing group Backseat Drawing – awesome! what does the current information map look like? do you care about all of this as long as you can get to the stuff that you care about? what Google is trying to figure out is how can I read your mind from the couple of words you gave me – which pages you want to see of theirs out of all of those exabytes of data? is this a book? no. is it a visualization? yes. but it’s also interactive. where/how do I catalog this? how do people search now? suppose you’re Google and you get the query “jaguar” – what do they want? “google” is also in the top 10 queries per day – why?? are they trying to cause the recursive meltdown of Google’s servers? what have you noticed? what have you not noticed? how do we learn? how do we help our patrons learn? The concept of “Library 2.0” has been around long enough now that we’ve gone through all the stages and argued it to death, as noticed by Andy Woodworth in a post titled Deconstructing Library 2.0. That’s a good thing, and you should go read his thoughts on the subject. In his paper Participatory Networks: The Library As Conversation, Dave Lankes said that “libraries should focus on the phenomena made possible by the technology,” not the technology itself, which I think is a pretty good way of thinking about “Library 2.0.” Maybe that’s where we are now, which would be a great way to continue the discussion, hopefully without the moniker. I think several of us thought that’s what we were doing, but it didn’t come across that way. The hard part, though, is that Library 2.0 doesn’t really replace anything. Like so many library services, the opportunities these new tools afford us are in addition to everything we’re already doing, which causes problems, because we don’t get additional resources to implement them. To serve as many of your users as possible, you have to be in as many of the places where they are as possible. That principle has been the philosophy behind this site from day one, eight years ago. That means being out in your community physically and digitally, and that’s one of the pieces of L2 that I think was never adequately explained. We’re already pretty good at getting out from behind the physical reference desk. We know how to do it, and we know how we could do it better given more resources. I worry that this is less true in the online world, and that’s where I always hoped L2 would help. As much as I support, love, and advocate for user-centered planning and design, my big regret about the whole “movement” is that it hasn’t focused more on how L2 helps staff. 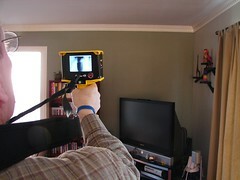 So that’s what I tend to concentrate my own presentations on – the practical ways in which these new tools can help you. I’ve been a big promoter of RSS since 2002, and I still don’t understand why libraries don’t use it more. Yes, one of the benefits of syndicating content is that your users can subscribe to it, but equally important for me is that it allows me as an organization to get my content off my website so that it’s more visible where my users are. Most importantly, it automates that process so that I don’t have to spend precious resources manually updating a multitude of sites, inevitably forgetting about one of them. The fact that I can syndicate lists of new materials from my OPAC anywhere without human intervention? Priceless. Why should your library have a blog? There are many benefits, but my biggest reason is because it gets your current news and announcements in a syndicated format, the display of which you can automate anywhere. You can easily recycle your content to Twitter, Facebook, elsewhere on your website, and more. Talk about a great way to get out into your community – how about displaying your current news on the village, park district, school, or a department website without any ongoing effort on your part? That’s a huge win-win in my book. And as someone who manually generated archives for daily posts before there were “blogs,” let me just sing the praises of automatic archiving for a moment. If you’re not using a blog for press release-like information, do not pass go. There’s a better way that makes you more efficient and has all of these ancillary benefits with cherries on top. Being able to offer inexpensive options for chat reference so that you can concentrate on implementation rather than budget? Win. Being able to embed that chat window on your website, in databases, on Facebook, etc., without a huge effort? Win times one million. Putting immediate, synchronous access to a librarian back into the catalog by embedding a chat window there? Win times infinity. Having easy-to-use alternate announcement channels where you can also talk with and hear from your users (eg, Twitter)? Full of win. Same thing with social bookmarking (delicious – all of your library’s bookmarks in one place, searchable, embeddable), social pictures (Flickr, where you no longer have to worry about resizing images), wikis (cheap intranet possibilities), embeddable subject guides with syndication (LibGuides), and more. They all have the potential to make your job easier. How often does that happen? So, Andy is right to ask questions about Library 2.0 and reflect about its impact, as are the commenters on his post. For me, though, one place L2 has failed is in making staff understand that these tools can offer big benefits for them, not just library users. If we’re adopting tools to make ourselves more efficient (which I think is the best way to evaluate implementation for staff), then that counts as success in my view. If it reaches new users, offers new services for existing members, or makes things better in general for users at the same time, then we’re really doing something right. That piece is more difficult to measure, which makes the L2 debate somewhat moot, since no one can really prove or disprove it. But when done well, Library 2.0 should help you in your job, too. Or, if you work at certain companies, you do. Or could. I had some interesting conversations about privacy at ALA’s Midwinter Meeting, which got me thinking about which companies probably know the most about me. I’ve thought about my own “walled garden” a lot and worked through what I’ll share publicly, privately, and pretend privately. Most things I share publicly, and you can see a list of many of the sites I use on my FriendFeed account. It’s not difficult to piece together information about me by tracking these sites, but overall I’m more careful with specific things like location information. The routine I’ve worked out is that Facebook is my only truly private posting area, although I do occasionally post some pictures for “friends and family only” on Flickr. Since I still don’t trust Facebook to not re-publish or claim ownership of “private” content (like pictures and videos), I don’t post anything original there except status updates and comments on friends’ updates. Even then, I don’t kid myself that those things are truly private (they’re the “pretend privately” I mentioned above). That’s why I’ve become a lot more selective about who I’ll friend there, and why I post some Foursquare location updates there (rather than on Twitter). Obviously I’m okay with what I share publicly, and in many respects, there have been enormous benefits to doing that, but I have very little control over what these companies do with the information they’re collecting about me, and I don’t trust any of them. I think the only company I do trust is LISHost, which hosts my website and email (thanks, Blake!). How much do I really care that Facebook keeps my status updates forever, whereas my email provider keeps my more private messages? And how much do I worry that my private email still goes through my cable provider’s network to get to LISHost? I’m trying to recognize which companies are collecting ambient information about me, without me proactively posting anything. I’m sure I’m missing some, though. If you’ve thought through this yourself, what’s not on my list? I’ve been mulling over this post for several weeks now, but a conversation that happened on Twitter today prompted me to finally write and publish it. It started when Kenley Neufeld wrote a post about participating in ALA and tweeted the link. 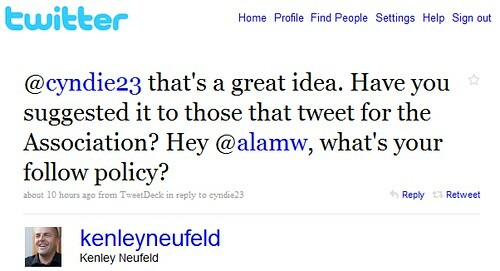 Cyndi E. engaged Kenley in a conversation about ALA following its members back on Twitter, which led Kenley to ask ALA’s Midwinter Meeting account what its follow policy is. Well, I work for ALA, and I run that account (along with three others), plus my personal one. The “royal” ALA has no official social media policy, although there is an internal staff task force working on one. I’m not on that group and I haven’t wanted to step on any toes, which is why I haven’t said much online about this topic, but that doesn’t mean I haven’t thought through some things for the accounts I manage. Given today’s conversation, I thought I’d share my approach and solicit feedback for what you think is and isn’t working. Before I go any further, though, I want to note that I kind of fly by the seat of my pants with this stuff at work. I already have a couple of full time roles (as does pretty much everyone at ALA HQ), and tracking what’s said about MPOW online is pretty near impossible these days. Amongst the good and bad about the American Library Association, the term “ALA” also gets used for A List Apart (especially when they publish a new issue), the abbreviation for “Alabama” in news reports, Ala Moana in Honolulu, ala mode, “ala” meaning “in the style of,” in Spanish, and more. I do the best I can, but no one person could catch it all unless it was their only job responsibility. I know a lot of folks struggle to get support from the top in their organization, and I’m lucky that this isn’t one of the battles I have to fight. All of which is my way of saying, your mileage may vary, even within ALA. These are just my thoughts for how I’m handling four Twitter accounts at work, and I’d love to hear how you think I could do this better. Maybe this list willl even give you some procedural ideas for your own institution’s efforts. I mainly monitor and manage Twitter and FriendFeed accounts, so that’s where I focus my efforts. I’m lucky that others have taken on the mantle of managing ALA’s Facebook, LinkedIn, Second Life, and YouTube presences. These are the guidelines I’ve been following for Twitter (I still need to implement most of these on FriendFeed). My goals for the accounts are to listen, answer questions, interact, and inform. I follow most public accounts that follow us, as long as its not a spammer, bot, or “social media expert” who has thousands of followers. I don’t have anything against the gurus, but they’re not the audience I want to interact with. It may take me a week to log in and follow all the new folks, but that’s my goal. I’m somewhat passive about this because of the lack of an easy way to handle followers from one source, although right now I’m actively trying to follow any human being who say they’re attending our Midwinter Meeting this week. I do this to make it easier to listen and respond, plus it gives these folks the ability to direct message us. The exception to rule #2 is that I don’t follow private accounts. I realize some folks make their accounts private to avoid spammers, but I can’t tell those from the folks who truly want their tweets to be private. As an organizational account that multiple staff members might have access to, I don’t want to expose those tweets or set up a situation where someone might accidentally retweet something private. I try to do more than just click a bookmarklet, so I’ll rephrase content to get it down to 130 characters or somehow add value to the headline of a press release. I try to be human and avoid marketing speak, and I don’t get hung up on capitalization, even though my undergraduate degree is in journalism. I do my best to shoot for 130 characters to provide for easy retweetability. Although this doesn’t apply to all organizations, I’m a big believer in the “right of first tweet.” Within ALA, there’s no one “master” Twitter account for the Association as a whole. Instead, every office, division, round table, etc., has its own account. In order to help build the audience for those accounts and give credit, I try to not announce news first that really belongs to other ALA units. Instead, I do my best to retweet their tweets. That doesn’t always happen, but I think it’s their right to have the first shot at it. Something new I’ve been trying lately is to avoid retweeting someone else’s content immediately after they tweet it, especially if they’ve used a hashtag. Instead, I use HootSuite to schedule the tweet at a different time of day in order to try to reach a different audience that may not have seen the original one. If it was a morning tweet, I’ll schedule the retweet for the afternoon, and vice versa. I’m currently using bit.ly to shorten URLs so that I can get statistics for how often links are being followed. I also try to use custom bit.ly URLs for links I know I’ll re-use a lot. I fervently wish HootSuite would get rid of the frames on its ow.ly service or at least give URL creators the option to turn them off. Until then, I’ll keep using bit.ly. Rather than counting the number of followers as a metric, I’ve started tracking conversations. I still haven’t found what I consider to be an optimal way to do this, but for the moment, I’m clipping tweets to a notebook in my Evernote account (I’m on the free service for now) so that I can find them again. Because it’s so difficult to track the term “ALA,” I haven’t found an easy way to report out what’s being said about us, other than by manually writing up an email. Personally, I have an unlimited text messaging plan (I <3 texting), so I use notify.me to have Twitter mentions sent to my phone via SMS so that I get immediate alerts when someone mentions or directs a tweet to one of the ALA accounts. If you don’t want to go the SMS route, you can have the notifications sent to an email address, instant messaging account, or to a desktop app/widget. And this setup doesn’t necessarily mean I respond right away, especially if I’m out with friends, watching a movie, or if it’s late at night. I’ve worked hard to balance my work and personal lives, and so far it’s working fairly well. But the notice gives me a heads up, and I can then assess the urgency. Those are the various Twitter issues I’ve thought through so far. Based on some other problems that have come up at work, I have some general advice for other organizations using social sites. Did you know that the person who creates a Facebook page can never be removed? Never, ever, ever, ever plus a day. The only way is to delete the person’s account, which an organization can’t do if it’s a personal account. So be careful about who creates your organization’s page(s), because you’ll never be able to remove that person as an admin. You can add other admins, but you can’t remove the original creator. Add my voice to the chorus of frustrated users who wish Facebook would change this policy yesterday. Be very careful when you’re setting up your bit.ly links. If you accidentally paste in the wrong URL (which I’ve done), you can’t go back and change it. Ever, as in ever plus a day. If you mess up a custom URL, you’ll never be able to get it back. Ever. Did I mention ever? And speaking of bit.ly, if you haven’t already done this, you might want to go grab the most obvious custom bit.ly URLs for your organization so that someone else doesn’t use/steal/hijack them. Especially if you want a short and easy way to point to your own site on Twitter and get statistics for number of clicks. You can decide if you want to do this on other URL shortening services, too. So those are some quick thoughts that have been swimming around in my head. I’d love to hear your thoughts about how I can do this better, and what you’d like to see from the ALA accounts I run. As the gentleman who performed the audit (Jim) worked, we had a lovely talk about a variety of things, including libraries. We talked about ebooks (he has a Kindle) and libraries (he thinks we’ll be cut out of the picture) and library services in general. Jim mentioned how he tries to work with organizations to improve energy efficiency, including libraries. Apparently he’s worked with Wisconsin libraries to give each one a wattmeter to circulate to residents who want to monitor their electricity (see this example). Jim is eager to work with Illinois libraries to see what we could do to help patrons who want to do more to make their homes more energy efficient. Chicagoland libraries already circulate museum passes, some libraries still circulate art, and there are toy libraries, so why not this service? Several libraries are offering new gadgets for circulation (GPS devices, Flip video cameras, ebook readers), so lending technology isn’t new, either. There’s a lot of talk right now about green libraries, but can libraries green go that next step and help green their communities? I love the idea, especially when combined with complementary programs, reading lists, and community connections. Are any libraries outside of Wisconsin offering this type of service? If you’re in Wisconsin, have patrons been using your wattmeter? 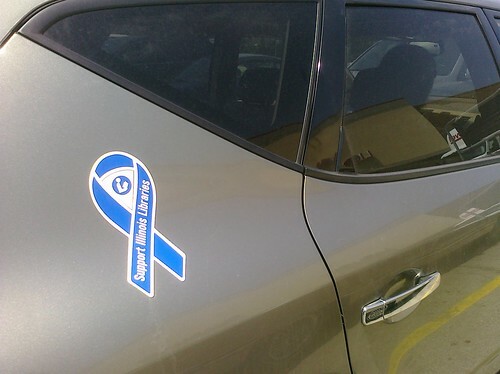 Mississippi Valley Library District Selling Magnetic Library Ribbons for Cars, etc. I don’t see this anywhere on the web (either on the ILA site or the MVLD one), so I’m posting this to help publicize the effort. It appeared in the most recent of the Illinois Library Association’s e-News. “The magnetic library ribbons measure 8” and say, “Support Illinois Libraries.” They sell for $1 each for amounts of 100 or more. $1.25 each for smaller amounts. Shipping will be extra or you can pick them up at the Mississippi Valley Library District (408 West Main, Collinsville, IL 62234; phone: 618.344.1112 ex. 113; fax: 618.345.6401). Please contact Barbara Rhodes (barbarar at mvlibdist.org) and send her your name, library (if applicable), address, and phone number. Indicate if you would like the ribbons shipped or if you will pick them up. I’ll admit that when these magnetic ribbons first started appearing everywhere, I wasn’t a fan. But a few years ago, MFPOW started offering ones the ones that Mississippi Valley is using, so I put one on my car. It’s still there today, and I confess that every time I look at it, it gives me a twinge of pride. YMMV (no pun intended). 4:35 pm Comments Off on Mississippi Valley Library District Selling Magnetic Library Ribbons for Cars, etc. What Is a Shifted Librarian?